From Goodreads ~ For almost six turbulent years, award-winning writer Diane Schoemperlen was involved with a prison inmate serving a life sentence for second-degree murder. The relationship surprised no one more than her. How do you fall in love with a man with a violent past? How do you date someone who is in prison? 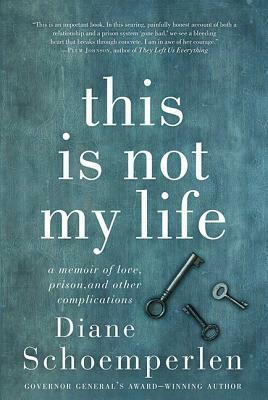 "This Is Not My Life" is the story of the romance between Diane and Shane - how they met and fell in love, how they navigated passes and parole and the obstacles facing a long-term prisoner attempting to return to society, and how, eventually, things fell apart. While no relationship takes place in a vacuum, this is never more true than when that relationship is with a federal inmate. In this candid, often wry, sometimes disturbing memoir, Schoemperlen takes us inside this complex and difficult relationship as she journeys through the prison system with Shane. Not only did this relationship enlarge her capacity for both empathy and compassion but it also forced her to more deeply examine herself. In 2006, Diane met Shane when she began volunteering at a hot-meal program in Kingston. Shane was on an escorted temporary absence from a minimum-security prison ... he was serving a life sentence for second-degree murder. Within a few months, she and Shane, both in their 50s, became friends. A year later, they were in love and in a relationship. Shane was eventually paroled and moves in the Diane. He was extremely needy and manipulative and totally disrupted her live. She makes her living as a writer and he was constantly calling her and giving her the space she needed. He was mean and nasty and didn't treat her very well at all. Forty-nine days later, he moved out, they broke up and Shane eventually ended up back in prison. Within a year, though Shane was still in prison, they were back together. She felt that they didn't have the support they needed for their relationship to succeed and this time they did. But the relationship failed again and they broke up, this time for good. For Shane, it seemed to be all about him. He'd spent 30 years in prison and didn't know how to act in the real world and wasn't willing to change and adapt. Diane put up with a lot, not wanting to give up on the relationship or Shane. She saw a lot of good in Shane and they had some good times but it seemed like the bad times outweighed them. I found this to be an interesting story. Not only did it give insight on Diane and Shane's relationship but also on the Canadian prison system and what's it's like to date an inmate. I liked the writing style. As a head's up, there is swearing and adult activity.